In 2015 and 2016, we got Christmas trees at Able's on Sunrise. We were extremely happy with the trees that we got there. When that lot disappeared this year, we weren't sure what to do. Last Friday night on the way to the Gainsley's Christmas Party, we stopped at a lot at Cal Expo and then at Lamb's in Elk Grove. We bought trees at Lamb's from 2009 to 2014. We ended up buying a flocked tree at Lamb's. I picked up the tree on Saturday morning (December 2). Sharon's nephew Eric came over and helped us get it into the house and up on the stand. 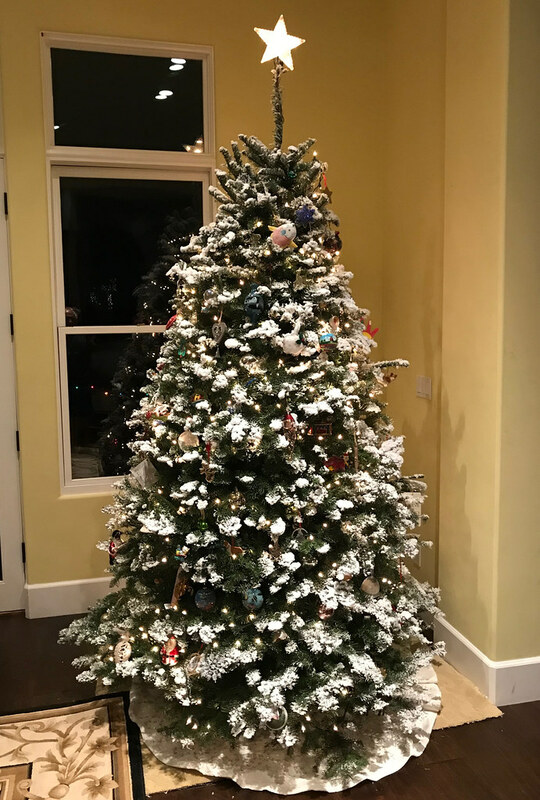 We decorated the tree after dinner [December 5]. Sharon is not completely satisfied. Although it is a great looking tree, she thinks it is too small. [Note to self], let her pick out the tree next year!